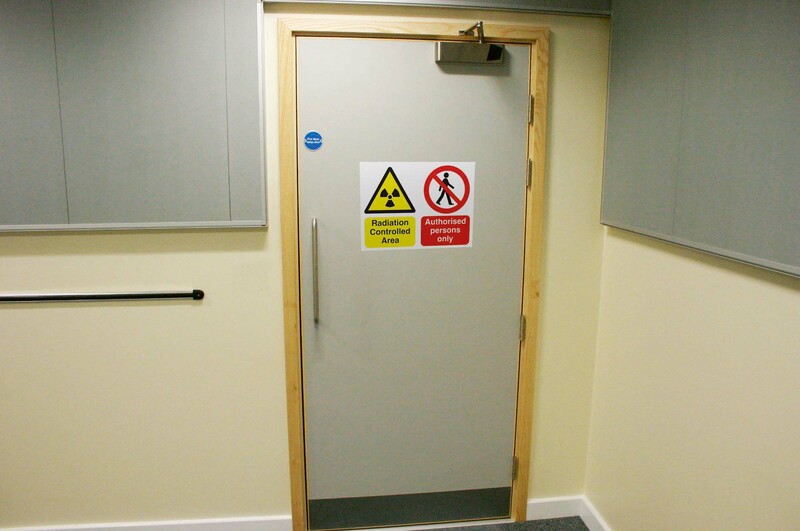 Radiation Doors – Hazlin of Ludlow Ltd.
Hazlin offer a range of high performance radiation resistant doors. There are two types of radiation: ionising & non ionising radiation. Ionising radiation is defined as radiation that produces ionisation in matter. When ionising radiation passes through human tissue it has sufficient energy to damage the cell DNA. Examples of ionising radiation are, alpha particles, gamma rays and x-rays. The use of our lead lined doorsets prevents leakage of ionising radiation. ionising & non ionising radiation. particles, gamma rays and x-rays. Non ionising radiation is radiation that does not produce ionisation in matter. When passing through body tissue it does not have sufficient energy to damage cell DNA. An example of non ionising radiation is Ultra violet radiation. 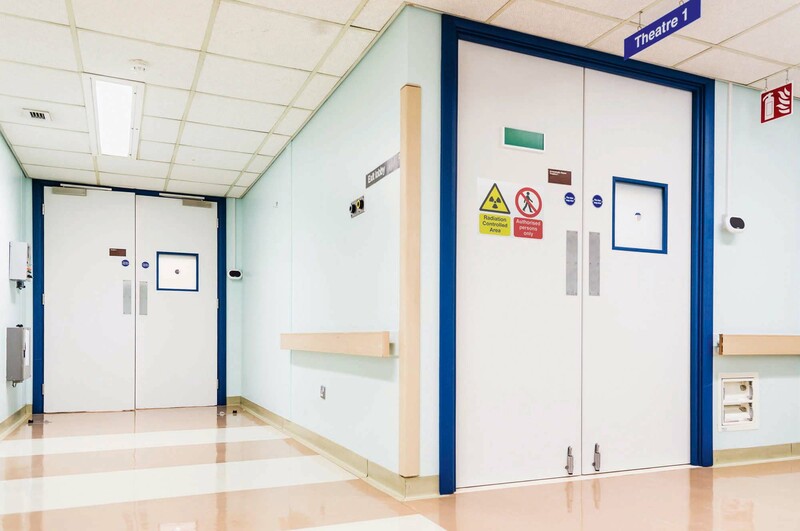 The primary use of our radiation doors is for the use of controlling Ionising Radiation mainly in hospital & other health related buildings. Radiation produced by X-rays needs to be controlled & its passage through the fabric of the building is prevented by the incorporation of a layer of lead or barium . We are able to manufacture lead sheet bonded to plywood or plaster board sandwich constructions as well as incorporated in doors. The thickness of lead is dependent on the level of resistance that is required. The resistance to x-ray radiation is made possible by the use of lead sheet. Lead sheet of various thicknesses can be incorporated to give the required “lead equivalence”. The consequence of using lead in the construction of radiation doors is the weight of the doors. An average sized door would easily exceed 100kg. The actual figure being dependant on the door size and the lead equivalence required. Manual handling assessments would need to be carried out to prevent serious injury to those installing the doors. Door frames are manufactured with lead incorporated into the stop, and also into the back of the architraves. To seal the back of the frame, we bond appropriate thickness of lead to plywood so that the whole aperture is sealed. Smoke seals and seals can be installed as required to meet both the fire and acoustic requirements as appropriate. the glazing bead area. All glazing frames are wrapped in lead to ensure that no discernable leakage occurs. Special lead glass is used to maintain the lead equivalence rating to each vision panel. The construction of our door sets is similar as for lead, but we substitute copper foil instead of lead. It is usual for the copper in the door to be earthed or bonded to the shielding in the frame and wall. The most common purpose is the forming of a “faraday box” to protect anything within the box from electro magnetic fields. Under tests using 37GBq241 Americium source, no discernable radiation leakage found. Professional testing outcome carried out by Radiation Protection Service within Imaging & Mediacla Physics Group of University Hospital Birmingham NHS Trust.